Part 3. Journalism Under Fire. Accepting the Baltic republics into the EU and the Easter Partnership countries associating with EU was accompanied by the ideology of exporting European values. The European Union’s expansion into the post-Soviet space was primarily presented in Brussels as the proliferation of Europe’s democratic norms, institutes and practices into former Soviet Union republics. The goal of bringing the post-Soviet states closer to the European Union was to increase their respect to democracy, human rights, freedom of speech and other accepted values of modern Europe. However, the actual political practices of the former Soviet Republics after joining or associating with the EU still remain a far cry from the EU standards. The Baltic countries and the EU Eastern Partners are a space which uses arrests, abduction and murder of journalists, administrative pressure on media, threats of violence towards opposition outlets and their staff. Estonia, Latvia, Lithuania and Ukraine have their hounded dissidents and political prisoners arrested for expressing their views. Human rights groups point out the plight of these people, recognizing them as prisoners of conscience. Despite the European Union flags strewn about with reason and without, the post-Soviet Republics continue with the worst Soviet practices rather than the European freedom of speech standards. Pluralism of opinion and free discussion is recognized on paper, but in practice, the political regimes aim to create an ideological dictatorship. Lithuania and Latvia adopted laws that forbid anyone from diverting from the official point of view on certain historic events: speaking an alternative opinion leads to criminal punishment, up to multiple years of prison. Any attempt to question the official ideology in its crucial points activates a repressive mechanism against dissenting thought. The “heretic” brand is handed out on a state level with the Prosecutor’s Office and secret services, as well as “social activists” – the state’s little helpers, who seek to personify “the people’s rage.” This is best seen in Ukraine, where paramilitary ultra-right groups with political leadership’s willing negligence and silent approval go about killing journalists and threatening to burn down the offices of unwanted media, abduct war reporters in the South-East conflict zone. The surreal part is that all of these insults to European values in Ukraine and the Baltic countries are accompanied with slogans of European integration, making the European choice and switching to EU standards. Joining the EU and EU association gives the Baltic states and Ukrainian government the basis to say such slogans. The fact that they are growing closer with “United Europe” is shown as proof of their progress to European values and standards. But when the decision to integrate the Baltic countries and Ukraine’s association with EU was made, the EU member-states did not demand any real progress in terms of democracy, freedom of speech or human rights. They were satisfied with a declaration of their admiration of these values, without actually following them. With Ukraine, the EU countries gave up on their demands on freeing political prisoners and conducting structural reforms in law enforcement, respecting freedom of speech and respecting minority rights so that president Viktor Yanukovich (after being declared illegitimate) signed the EU Association agreement and the Deep and Comprehensive Free Trade Area (DCFTA) agreement. With the Baltics, Latvia and Estonia were allowed into the European Union, letting them keep their anti-democratic and anti-European institute of non-citizenship – stripping the fundamental rights of hundreds of thousands of people. Europe’s de facto neglect of its own values with a declarative support of them led to violations and power abuse in the Baltics and Ukraine under EU flags. Suppressing freedom of speech is a clear example of the gap between the ideology of the European choice and the actual practices led to the corrosion of European values on the whole EU Eastern border. Under the influence of this dramatic clash, the value paragon is falling apart, the term “European values” becomes a testament of total hypocrisy. And this not just a problem for Ukraine, Estonia, Latvia or Lithuania, but for all of Europe. Part 1. Police Democracies. Attacking Dissenting Opinions in Lithuania, Latvia and Estonia. Suppression of freedom of speech in the Baltic countries is done out of a need to protect Estonia’s, Latvia’s and Lithuania’s history mythology. This mythology is based on the Continuity Theory and Soviet Occupation of the Baltics theory. According to these theories, the modern Estonia, Latvia and Lithuania are legal successors of the interwar republics of 1918-1940, the existence of which was interrupted by their forced inclusion into the Soviet Union. Views of the Baltic countries Soviet period as “Soviet occupation” became the new nation and state building foundation for Lithuania, Latvia and Estonia after the USSR’s dissolution. The occupation doctrine defined the political and economic development of these countries, served to exonerate the removal of citizenship and robbing hundreds of thousands of Latvians and Estonians of their fundamental rights, discriminating the Russian-speaking population, refusing to abide by European Union agreements on educational and language policies, supporting national minority rights. Combatting the denial of “occupation” is a self-defense mechanism of the Baltic political regimes, who gain their legitimacy and excuse their actions with the occupation doctrine. The weakness of the official mythology lies in its difference from historic facts and the inability to clash with any opposing point of view in a free discussion. This leads to the Baltic governments to activate their oppressive mechanisms and administer criminal punishment for denying the official stance on 20th Century Baltic history. In Lithuania’s case, the legal statistics show that the law against “exoneration of Soviet Aggression” boils down to attempts to stop the spread of information on the 13 January 1991 events in Vilnius, which paints the founders of post-Soviet Lithuania in a bad light. As part of a failed attempt by the Soviet government to suppress the separatist Sąjūdis movement and forcibly restore constitutional order in Lithuania, the clash at the Vilnius TV tower left 13 dead. The Lithuanian officially approved version of these events states that the Soviet military killed these people when they tried storming the TV Center, ran them over with tanks and shot the defenders. And for over 20 years, they deny the testimonies of eye witnesses, who say that the Soviet troops did not open fire on the crowd and instead the defenders were shot by snipers on the roofs. In 2010, after the criminal Code was amended, the former vice-mayor of Vilnius Algirdas Paleckis got into trouble after talking about the 13 January events on a radio show and saying “as it turns out now, our people were shooting our own.” These words had a criminal case started against Paleckis, and only a massive rights campaign and criticism from Vilnius’ Western allies about the freedom of speech allowed the politician to get away with a monetary fine and not time in prison. In 2013, the First Baltic Channel (PBC) – a rebroadcaster of the Russian Channel One programmes was taken off the air in Lithuania for a journalistic investigation into the Vilnius TV Tower events. PBC ran the report of the Man and Law (Человек и закон) program, which brought up the testimonies of the eye-witnesses who saw snipers on the roofs of the TV center, as well as words of the former commander of the Sąjūdis attack squads Audrius Butkevičius, who admitted that the crowd was shot by his men, and the decision to do this provocation and make the USSR out to be the bloody aggressor was made by the first leader of the restored Lithuanian state Vytautas Landsbergis. In 2016, the Lithuanian government started criminal and administrative cases against the publisher of the Russian journalist Galina Sapozhnikova’s book The Lithuanian Conspiracy and the Soviet Collapse - Investigation into Political Demolition which recounted the eye-witness testimonies from the Vilnius tower events and saw the snipers. The Lithuanian State Security Department (Valstybes Saugumo Departamentas, VSD) confiscated the whole printing run of Sapozhnikova’s book in Lithuania, and the 78-year-old publisher Povilas Masilionis was accused of “denying occupation.” And Sapozhnikova herself was denied entry into the country, the presentations of her book in Lithuania were disrupted, and the Lithuanian diplomats tried to disrupt the presentation of this book in Rome, Milan and Minsk as well. The punitive machine is also used when the need to protect the other Baltic cornerstone myths. For example, the idea of Stalin Deportations – the forced deportations of Estonian, Latvian and Lithuanian residents to Siberia in 1941 and 1949. The Baltic states call these “genocide” and equate them to the Holocaust, using them as proof that the Soviet Union and the Third Reich were equally criminal totalitarian regimes and that the Soviet period of their history was “cruel inhumane occupation.” So they react feverishly to any criticism of this or when someone points out how insensitive it is to compare it to the Holocaust. In 2012, the Latvian Security Police started a criminal case against publicist Alexander Gilman for his article on IMHO-club.lv where he thanked Joseph Stalin for deporting his family to Siberia in 1941, noting that almost all Latvian Jews who weren’t deported were later killed by the Nazis and their Latvian collaborationists. Ultimately the court failed to find anything criminal in Gilman’s words. Another taboo subject is the issue of the Forest Brothers movement – guerrillas from the nationalistic underground, who fought the Soviet government in the Baltics after World War II. The Forest Brothers are the only argument in favor of Lithuania, Latvia and Estonia’s entry into the USSR being forced and the population resisting. So criticizing the nationalistic underground leads to harsh repressive measures. Thus, in 2017, Lithuanian writer Rūta Vanagaitė was outright hounded for speaking out against the glorification of the Forest Brothers and their leader Adolfas Ramanauskas (codename Vanagas). Vanagaitė stated that during the war, many of the future guerillas worked with the Nazis and took part in murdering Jews, while their leader Vanagas was a NKVD (People's Commissariat for Internal Affairs) agent and turned his accomplices in to the Soviets before getting shot. The Lithuanian Prosecutor’s Office started an investigation into Vanagaitė’s words, her books were taken off store shelves, the publishers refused to work with her, there were threats of violence against her on the streets and online, and the “patriarch” of Lithuanian statehood Landsbergis called for Vanagaitė to go and hang herself in the woods. Ultimately, the writer had to emigrate from Lithuania. Similar pressure was applied towards Klaipėda municipal deputy Vyahceslav Titov, who spoke out against the construction of a memorial plaque for Adolfas Ramanauskas-Vanagas at Klaipėda University and called the leader of the Forest Brothers guilty of the murder of thousands. The prosecution is now investigating Titov, they want to take away his municipal seat and pro-government activists pursue him in public places. These examples show that the Baltics are home to a monopoly of ideology, which has nothing in common with the declared values of freedom of speech, pluralism of opinions and democracy. 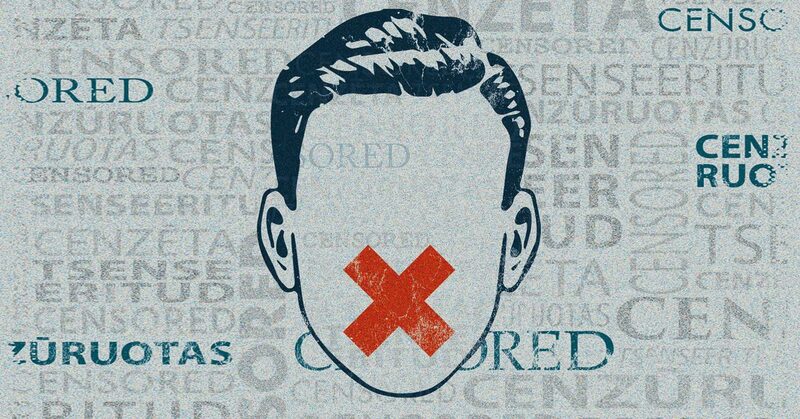 Instead of the accepted free discussion, the Baltics have a system of taboos, silencing and undesired topics, which make a proper discussion impossible on a number of issues critical to the political regimes of Estonia, Latvia and Lithuania. Using the administrative oppression to fight for ideological unity defines the special influence the Estonian, Latvian and Lithuanian secret services have on the public space. The Baltic secret services are the political police: persecuting opponents of the socio-political regime, threatening dissenters and conducting political censorship in the media. The Baltic secret services are still using the tricks of the Soviet KGB’s Fifth Division, which fought “ideological sabotage.” The typical methods of the Estonian, Latvian and Lithuanian “KGBs” include disrupting dissenting events, making provocations, keeping a list of opposition journalists and threaten “unloyal” media. Their “trademark” method in supporting the monopoly of ideology are entry bans and deportations from the Baltics for journalists and other public figures, who take a stance on history or politics that don’t sit well with the government. During recent years, the entry bans and deportations for publicists, film crews, public experts, historians, writers, actors and singers are in the dozens. In certain cases, the secret service consciously make a big scandal and deport people who already had entry to the country, as it was with the head of the Russian National Energy Security Fund (Фонд национальной энергетической безопасности) Konstantin Simonov. While the expert was having lunch in the middle of Riga, the police stormed in and declared that he was being deported from Latvia. Almost everyone deported from the Baltics are Russian citizens. However, there are exceptions. In 2014, the Estonian Internal Security Service (Kaitsepolitseiamet, KaPo) detained famous Italian writer, publicist and political figure Giulietto Chiesa at the Tallinn airport. The writer spent a few hours in a cell and was deported to Italy after the Italian ambassador to Estonia intervened. Chiesa’s case led to a diplomatic scandal between Tallinn and Rome: the Estonian government failed to explain to their Italian colleagues how someone’s political views let them ban an EU member-state citizen from entering Estonia, especially considering all of the European agreements on freedom of movement. However, the unwanted foreigners have it way easier than the dissenting citizens (or those who have had their citizenship stripped away – the non-citizens) of the Baltic states. The secret services practically officially pronounce them enemies of the state in their annual reports. The main trait of these reports is the publication of the lists of names of “unloyal” and “those presenting a threat to national security” media, journalists, public experts and socio-political figures of Estonia, Latvia and Lithuania. It is worth noting that these lists of “unloyals” from the Baltic secret services are almost always media and journalists who work on non-state languages – Russian, and in Lithuania – Polish. The discrimination of foreign media and journalists is another manifestation of the slight against national minorities in the Baltic countries. Lithuania, Latvia and Estonia have cruel language quotas on the media’s work for the non-titular population. In Latvia, the quota for Russian-language TV channels have ranged from 25 to 35% of the broadcasts among the years. The Lithuanian Seimas in 2017 established that no less that 90% of the TV airtime must be done with EU languages. And the MEPs and diplomats of the Baltic countries are doing everything they can to prevent Russian from getting the status of an official EU language, as it would improve the conditions of the Russian-speaking minority. Before Lithuania, Latvia and Estonia joined the EU, the European officials said that European integration would lead to a change of heart, boosting the local governments’ respect of rights and freedoms, including freedom of speech. This belief was based on the Copenhagen Criteria for EU membership from the European Council Declaration in 1993 in Copenhagen, with the entry requirements for the EU candidate countries, which the Baltics agreed to. The political part of the Copenhagen Criteria presumed following the European Human Rights Convention, Article 10 of which guarantees the freedom to hold opinions and to receive and impart information and ideas without interference by public authority and regardless of frontiers. In reality, the requirements for the Baltic countries’ entry into the EU turned out be formalities and the social processes in the Baltics are leading to a tighter monopoly of ideology and oppressing the population. Depopulation and ageing, the youth emigrating to Western Europe strengthen the nationalists’ influence and raise the importance of history, language and nationality policies. And the disappointment coming from the actual state of Lithuania, Latvia and Estonia and the expectations of what people fought for, through the years of independence, urge them to look for internal and external enemies, who they can blame for their failures. The Baltic political regimes are preserving themselves and while fighting for the status quo they are using more and more repressive measures towards the opposition. In Latvia, when the movement to save education in the Russian language began, there were a number of criminal cases against opposition journalists and rights activists, with one of them imprisoned and two more being restricted on travelling. Vladimir Linderman, after two weeks of custody as released. Alexander Gaponenko is still imprisoned. In addition to that, the founder and editor-in-chief of one of the biggest Russian language sites in Latvia IMHO-club.lv Yuri Alexeev is under investigation and restricted from travelling. Late 2017, the DP searched his apartment and found ammunition. Alexeev now has a criminal case against him and he claims that the police planted the ammunition in his apartment. The events of these past months in Latvia show that the Baltic regimes are ready to take it to the next level in fighting dissent and moving from monetary fines and suspended sentences to simply imprisoning anyone who disagrees with the official ideology and policies. This tendency can be stopped by European or US intervention. International organizations always react negatively to suppression of freedom of speech in the Baltics, provided the information of such violations actually reaches them. The shut down of the First Baltic Channel in Lithuania in Autumn 2013 was criticized in the OSCE. “In general any attempts to limit pluralism in the media should be met with resistance. The freedom of the media depends on a healthy and energetic media space, which includes mass media outlets, which present news in multiple languages and from multiple countries” said the OSCE Representative on Freedom of the Media Dunja Mijatović on the FBC’s shut down. Paradoxically the criticism from international organizations doesn’t lead to freedom of speech in the Baltics improving, instead it had the opposite effect. Thus, the precedent of shutting down the First Baltic Channel in Lithuania led to a whole wave of bans for Russian channels in the Baltics. Criticism of criminal persecution for “denying Soviet occupation” in Lithuania did not stop a similar law being passed in Latvia. The Paleckis’ case led to other cases against dissidents, who dared to challenge the taboos of the Baltics’ ideology. Criticism from international institutes is unpleasant for the Baltics, but far from critical. Only their “senior comrades” from NATO and the EU can influence them. In the years following the Maidan (also known as the Euromaidan, used here to refer to the Ukrainian 2014 Revolution in general), freedom of speech in Ukraine has deteriorated disastrously. This is seen in the persecution of dissenters, limiting media, attempts at disrupting events. The 2018 World Press Freedom Index by Reporters Without Borders ranked Ukraine was as low as 101. Idea and thought policing done by the ultra-right, who try to control the information pool and how much the information presented on Ukrainian media, making sure that specific opinions and events (political, social and recreational) align with the “correct” point of view – the ultranationalist and anti-Russian one. Diverging from the line leads to moral pressure and physical violence. The radical right regularly disrupt public events hosted by the Russian Rossotrudnichestvo (Federal Agency for the Commonwealth of Independent States, Compatriots Living Abroad and International Humanitarian Cooperation). On 17 February 2018, a group of 30 people broke into the building, damaged the property, and threatened violence to the agency’s staff. After this, the Kiev police unilaterally left the agreement to protect the Rossotrudnichestvo office. On 9 May 2018, the head of Rossotrudnichestvo Konstantin Vorobiev was attacked near his home in Kiev. The Ukrainian Inter TV channel is facing obstructions. 9 May 2018, Inter prepared a celebratory concert for Victory Day, where they spoke out against Nazis and the policy of glorifying Nazis and forgetting World War 2 in modern Ukraine. The Ukrainian National Council on TV and Radio criticized Inter’s announced video clip, publishing a statement on their site that the clip in question was aimed at dividing the people and is another attack in the information war. In order to stop it being broadcast, the ultra-right groups blocked the building and tried setting it on fire. Harlem Désir OSCE Representative on Freedom of the Media condemned these actions and called the Ukrainian government to create a safe environment for journalists. The Ukrainian government’s and law enforcement’s willful inaction in these cases either shows an inability to maintain order and loss of control over social processes or a vested interest in pressuring the media and disrupting public events. Ukraine has the Myrotvorets (Ukrainian for Peacekeeper) website which compiled files on Ukrainian and foreign citizens who are viewed as potentially dangerous to the current regime. Getting “blacklisted” meant that risks of arrest and deportations (for foreign citizens) are higher. Myrotvorets published personal data of journalists and other public figures, an act that was criticized on multiple occasions, including from Western journalists and the European Union. However, the promised shut down of the site never happened – after a small pause in 2016, it resumed its work. After the Maidan, around 20 journalists died in Ukraine, many in the conflict zone. And the investigations of the murder of Oles Buzina, other journalists who died in Donbass under undefined circumstances (Sergey Dolgov, Alexander Kuchinsky) are basically frozen. Oles Buzina, the former editor of the Segondya newspaper and critic of the current regime was shot on 16 April 2015 in Kiev, near his home. He faced threats and attacks prior to this. Condemnation of the murder and condolences came from the OSCE, USA, Russia and the UN Secretary-General. Reporters Without Border, USA - Committee to Protect Journalists, UNESCO and Human Rights Watch called for thorough investigation. The murder of Oles Buzina once again split the Ukrainian society. There was a wave of approval in the social networks, some Ukrainian media called Buzina an Ukrainophobe for his continued criticism of Ukrainian nationalism and considering Ukraine, Belarus and Russia to be close and brother-like unities, he did not support the Orange Revolution or the Maidan. During his life, Buzina condemned Ukrainphobia, as well as any other phobias against nationalities. On 18 June 2015, Ukrainian Interior Minister Arsen Avakov announced arrest of three alleged hitmen, who were from the radical right, among them were Andrey Medvedko and Denis Polischuk. The third one was released due to lack of evidence of his part. After the investigation, Polischuk was released for house arrest on 9 December 2015, Medvedko as well on 31 December. 25 March 2016, Polischuk’s house arrest was not prolonged and Medvedko’s was replaced with a personal recognizance. The second accusatory act, initiated by Buzina’s mother was reviewed on 28 November 2017. The court hearings are still underway, and as the plaintiff says, the process is has been classified and has multiple violations. After Buzina’s murder, the Ukrainian state film agency banned the film Oles Buzina: a Life Outside of Time (Олесь Бузина: жизнь вне времени) because, according to the agency, it sparked national and religious divide as well as showing the “Revolution of Dignity” and the Ukrainian national idea in a negative light. On 20 July 2016 Radio Vesti host Pavel Sheremet was murdered. He died to a bomb going off in the car that belonged to him and his domestic partner Olena Prytula. The police said that Prytula could have been the target of the assassination. The investigation reached a dead end, no information on the organizers or the assassins was unearthed. The investigation attempted to look for “the Russian trace.” The case itself was classified by the police on 24 July 2017 (and this itself became known only on 21 September 2017). And since early 2017, the investigation slowed down considerably with media coverage being reduced to a minimum. Also, according to the National Journalist Union of Ukraine,, since the start of 2018 and up to July, there were 43 attacks on Ukrainian journalists. Political censorship also reached the entertainment industry. According to Order № 3359/5 of the Ministry of Justice, any Russian films produced after 2014 and any movies promoting Russia’s army or law enforcement are banned from appearing on TV. Also, according to Order №1143 of the Ukrainian Cabinet of Ministers, the state film agency has the right to ban any movies (including Soviet ones) which star actors that are declared persona non grata in Ukraine. They have limited the broadcasts of 76 Russian TV channels (as of 12 December 2016). 16 May 2017, Ukraine banned Russian Social networks VKontakte (ВКонтакте) and Classmates (Одноклассники), the services Yandex, Mail.Ru, ABBY and others. Ukraine has also banned 140 Russian books, with the list constantly increasing. They are currently working and discussing a law that would ban the entry of any Russian-published books into Ukraine. Today opposition journalists and channels are faced with roadblocks, problems with prolonging accreditation and licenses, their staff being arrested. In more extreme cases they face threats and violence. Aside from Inter, which is periodically hit with non-scheduled searches, the same procedure is applied to the 1+1 channel. The excuse for these searches was the showing of the Soviet comedy Workplace Affair (Служебный роман) with Alisa Freindlich, who is a persona non grata in Ukraine. NewsOne and 112 Ukraina regularly face problems with getting their license renewed. Ukraine adopted a law on language quotas on TV – 75% of all content must be in Ukrainian. This discriminates the Russian-speaking population of Ukraine and creates additional difficulties for the predominantly and traditionally Russian-speaking channels Inter and Ukraina. The Ukrainian Institute of National Remembrance led by Volodymyr Viatrovych plays a significant part in this. The Institute authored the decommunisation laws and actively supports the glorification of Ukrainian Nazi collaborationists and OUN-UPA (Organization of Ukrainian Nationalists and Ukrainian Insurgent Army) glorification and hiding their crimes during World War 2. The Institute’s work is aimed at reimagining Ukrainian history in the context of the mass famine of 1932-1933, World War 2, refusing to use the term Great Patriotic War, criticism and condemnation of Ukraine’s Soviet period. In 2015, Ukraine forbade giving government accreditation to all Russian media, aside from the Dozhd (Дождь) channel (although, later even it was banned in Ukraine). They also deported or denied entry to many Russian journalists (among them are Zakhar Vinogradov, Anna Kurbatova, Maria Remizova, Daria Grigorova, in June 2018, Ukraine denied entry to Evgeny Primakov Jr. and Israeli Russia Today correspondent Paula Slier, who were supposed to take part in an OSCE event). Since 2015, there has been pressure on Ihor Huzhva, editor-in-chief of Strana.ua (Страна.ua) – he has been accused of evading taxes and extortion. Winter 2018, Huzhva fled Ukraine and asked for political asylum in Austria. The website continues to work and update. Searches in opposition media offices and arrests of journalists for questioning are now a common thing. In February 2015, the opposition journalist and blogger Ruslan Kotsaba, who called to boycott the fourth wave of military mobilization in Ukraine, was detained. Kotsaba’s arrest and trial led to harsh criticism from Amnesty International, who called for an immediate release of the journalist and called him a “prisoner of conscience.” The Kotsaba case was also criticized by the Independent Media Trade Union of Ukraine, the Institute of Mass Media and the Ukrainian Helsinki Committee for Human Rights. 12 May 2016, Kotsaba was sentenced to 3.5 years in prison, however this repealed on 14 July with him declared innocent and acquitted him. 15 May 2018 was marked with searches in the RIA-Novosti Ukraine office with the following detainment and arrest of the publication’s editor-in-chief from 2014 to 2018 Kirill Vyshinsky. He was accused of state treason and supporting separatism. The “evidence” consisted of Russian state awards found at his office, including the "For the Return of Crimea" medal, and a printed out map of Novorossia. However, the authenticity of the medals and which Vyshinsky’s actions, broke the law, were never presented or proven. Criticism and concerns on Vyshinsky’s arrest were voiced by the UN Human Rights Council, General Secretary of the International Federation of Journalists (IFJ) Anthony Bellanger, head of Eastern Europe and Central Asia Desk of RSF (Reporters without Borders) Johann Bihr, OSCE Representative on Freedom of the Media Harlem Désir, Secretary General of the Council of Europe Thorbjørn Jagland and many other international organizations. Altogether, the current situation puts any journalist, political scientist, researcher at risk if they disagree with the government line or speak out against the Ukrainian leadership’s policies. All of this along with the policy of using fear, pressure and limiting the actions of opposition journalists and dissenting individuals is far from the stated European values and adherence to international law. So disappointment in Ukraine by the West grows, and cases of criticism from international rights organizations and more and more frequent. Such words hurt the Ukrainian government, who, four years after the Maidan, are trying to convince their population of the all-around support of the international community of a “New European Ukraine.” However, this criticism is ineffective, because it can’t influence Ukraine’s development or make them change their policies and get them to actually protect freedom of speech, the tight to information and journalist and media security. So the pressure on Ukraine for freedom of speech from international rights activists is clearly not enough. If Kiev’s Western allies are interested in improving the situation for media and journalists in Ukraine, this pressure must come from states and interstate unions from NATO and the EU. Ukraine is claiming to want a place in the EU and declares itself to be part of “United Europe”, so the European Union has full rights (and an responsibility) to raise the question: without actually complying with European values of democracy, freedom of speech and human rights, there will never be any European integration for Ukraine. The situation on the Ukrainian East in Spring of 2014 did not improve things for journalists. From the very start, the conflict was flaring up not just politically and militarily, but also in the media batlefield. That is why journalists, “armed” only with cameras and recorders were viewed as full-fledged combatants. Bulletproof vests with the PRESS sign did not save the media from being shot at, and in some cases, just made them the priority target for those who decided that the public must not get news from the front. So the frontline didn’t just divide the rebels and the government troops, but also the journalists. Even working at an outlet unwanted by Kiev or the radicals usually meant that it was impossible to cover the conflict from Ukrainian military’s positions and led to many misfortunes, if they did end up running into the government troops. In order to hinder the work of reporters, the Ukrainian army, the volunteer radical battalions and secret services used the easiest and most reliable method: detaining them for trumped charges, stopping them from reporting. The extremist organization Right Sector (Правий сектор) was most notorious for abducting reporters and media, in August 2014, imprisoning the non-staff Rossiya Segodnya and Agence France-Presse photocorrespondent Maxim Vasilenko and Crimean Telegraph (Крымский телеграфъ) correspondent Evgenia Koroleva. According to the journalists, the Ukrainian radicals were ticked off by photos of the POW march in Donetsk, which they found when looking through Maxim Vasilenko’s memory cards and DNR journalistic credentials. In September 2014, OSCE demanded that all media personnel that were imprisoned be released and to stop further abductions. OSCE Representative on Freedom of the Media Dunja Mijatović called out some of the Ukrainian journalists’ names, but her list did not have the people from the “unfortunate” incidents with the Ukrainian military. As time shows, Kiev has not stopped abducting and arresting journalists (even away from the frontlines) in the following years. Their real feelings towards freedom of speech are quite obvious from the story of the Myrotvorets site, which published the personal information of all the journalists to ever get DNR accreditation. This included many Western and Ukrainian media. The Myrotvorets administration did not directly accuse them in aiding terrorism, but noted that “this is socially significant information and we, the citizens of Ukraine, must know this.”  The publishing of the list was condemned by many international organizations, including OSCE, and Myrotvorets was on the verge of shutting down after such an international scandal. Nevertheless, the site continues working to this day, publishing personal information of people, who get declared criminals without a trial or investigation. By the end of 2014, Ukraine was declared the most dangerous country for journalists (obviously the events in the country’s East made it reach top spot, which detainments, abduction and murder of journalists). This was said in the Reporters Without Borders report. According to the organization, in 2014, there were 33 abductions and 47 arrests of journalists, which is the highest number in the world. Ukraine also took third place for the amount of journalists killed (6 people). What were the circumstances of these deaths? Since the start of combat in Donbass, many Western journalists went there and the first victim was one of the founders of the independent photo union Cesura Italian freelance photographer and reporter Andrea Rocchelli. 24 May 2014, Roccheli got caught in a shelling not far from Slaviansk. The Russian rights activist following him, Andrei Mironov, also died and French photographer William Roguelon was wounded, but managed to hide from the fire at a rebel post. OSCE Representative on Freedom of the Media Dunja Mijatović called for an immediate and thorough investigation of the incident, right after the tragedy, to find those guilty, but the Ukrainian side showed reluctance in figuring out the circumstances of Roccheli’s death. This was noticed by Western media, the deceased’s relatives and lawyers. “[Roccheli’s parents] became increasingly frustrated with the progress of investigations conducted by the authorities in Kiev. It took a year and half for a ballistics examination to be conducted and the report, when it came, could not establish the bullets’ origin and type. Roguelon was not questioned, but nor was the civilian who had first warned the group [of the danger]. Missing also were testimony from soldiers in the area at the time. Lacking suspects the Ukrainian police called a halt to the investigation at the end of 2016, concluding that rebel fighters had been responsible though the exact culprit could not be identified.” La Repubblica quotes lawyer Alessandra Ballerini, “Ukraine sent us useless evidence, the taxi driver is lying, contradicting himself. We are now preparing a new request to conduct a repeat investigation, in order to study the logs of some phone calls, re-do the ballistic test and get testaments from other witnesses. Thanks to the insistence of Roccheli’s relatives, the Italian police continued its investigation and on 30 June 2017, these inquiries led the Italian authorities to arrest Vitaly Markiv (they presume that it was him who gave the order to open fire from the Karachun hill to the railway crossing, where Roccheli, Mironov and Roguelon were). The Ukrainian MFA’s official stance on the Markiv case clearly shows how the Kiev regime treats the journalists’ deaths, be they citizens of Russia, Ukraine or even the EU. The government immediately accuses the rebels, but can’t or doesn’t want to establish which side the barrage came from (with the wounded Roguelon, the question arises, why did he run to the rebel post, where they sent him to a hospital?) And the journalists themselves may be declared the guilty party, being in the wrong place and at the wrong time. However, this is not exclusive to journalists: many times, Kiev says that the peaceful civilians die from the war itself. Obviously, according to Ukrainian justice, the same abstract war is responsible for the death of eight civilians after an air strike in the Luhansk on 2 June 2014. As a reminder, OSCE recorded the fact of the strike, but for more than four years, no one from the Ukrainian police ever raised the question to bring those responsible for the order to bomb the center of Luhansk to justice. Unlike Roccheli, there was no one in the EU to stand up for the victims of that air strike. The next victims of the war in Eastern Ukraine were Russian journalists: in June 2014, a shelling started near the settlement Metallist in the Luhansk area hitting VGTRK (All-Russia State Television and Radio Broadcasting Company) correspondent Igor Kornelyuk (died from wounds at the hospital) and sound director Anton Voloshin (died on the spot). During the attack on a bus on 29 June 2014, Channel One cameraman Anatoly Klyan was fatally wounded. In late August, official information confirmed that Rossiya Segodnya photo correspondent Andrey Stenin was dead, he had been considered missing for almost a month. The Russian Investigative Committee started four criminal cases due to the journalists’ deaths and in 2016, the court found Nadezhda Savchenko of the Ukrainian military guilty in the murder of Kornelyuk and Voloshin, although she was later pardoned. The Investigative Committee of Russia charged Mykola Malomen, the commander of Ukrainian military Donetsk anti-aircraft missile regiment division with the involvement in the murder of Anatoly Klyan in absentia. And the Investigative Committee is still determining the circumstances of Andrey Stenin’s death. And the world community had no doubts that the Ukraine was supposed to discern the details of the death of Russian journalists in the Donbass. Many government and NGOs stepped forth with such statements. So the Committee to Protect Journalists with its New York HQ and the International Federation of Journalists expected Kiev to find those responsible for these tragedies. The UN Security Council also called for a thorough investigation of these violent incidents. OSCE also took a hard stance after each of these incidents, saying that Ukrainian government should immediately start investigations. It is unsurprising, that the international pressure made the Ukrainian government pretend to be concerned over the death of the Russian journalists and start criminal cases. The reaction of the Ukrainian president is telling in this case. “The President of Ukraine Petro Poroshenko, by the OSCE’s request, insists on a thorough investigation into the circumstances of the deaths of Russian VGTRK correspondent Igor Kornelyuk near Luhansk.” said the president’s press service. If not for the OSCE request, then the thorough investigation could be dropped. Of course, the Ukrainian investigation has made zero progress since 2014 to unearth the causes and circumstances of the Russian journalists’ deaths. And how could it be otherwise, if the Prosecutor-General and other agencies, always just blame the rebels for all of the crimes? And there could have been many more victims of the undeclared war in the Ukrainian East among the journalists: many media personnel near the frontline have gotten and continue to get shelled. In January 2017, during a shelling of Donetsk, a LifeNews cameraman was hit by a bomb fragment in the leg, the member of the local Donetsk News Agency was also wounded. NTV and Russia Today camera crews were also under fire. In the same month, an Anna News crew were shelled along with a correspondent with the Federal News Agency. In late 2016, a group of journalists was caught in a Ukrainian Army barrage in the Sakhanka village of the Novoazovsk region in the South of the self-proclaimed Donetsk People’s Republic. During the attack, the conflict zone had media crew of Rossiya, NTV, Channel One, 5 Kanal as well as the LNR and DNR republican TV channels Oplot and Union. NTV correspondent Ilya Ushenin noted that the shelling began as soon as the OSCE observers left the settlement. Covering the conflict remains one of the priorities of the local outlets, including republican (DNR and LNR) TV channels, who have their own war reporters. Russian reporters are also frequently near the frontline. And even so, today the presence of journalists in the conflict zone is controlled by the corresponding state agencies of the Donetsk People's Republic. In order to work in the danger zone, a journalist needs special military accreditation (standard journalist accreditation still allows for journalism in the DNR, but doesn’t allow access to the frontline). A lot of the information on the front comes directly from the DNR military command and the Ministry of Defense press service. Even though censorship is banned by law in the self-proclaimed republic, the local government completely controls its information space. The overwhelming majority of the media are state-owned. The information policy of the outlets is mostly formed by the DNR Ministry of Information. Frequently facts of working with “separatist” resources are enough to get one’s name added to the Myrotvorets lists or the sanction lists. We can note the example of Polish journalist Dawid Hudziec: covering the conflict, he never once took a weapon in hand, but he is still barred from entering Ukraine. Obviously Ukrainian journalists, who the state is teaching “properly” give information, are not thinking of visiting Donbass nowadays. In other words, as long as journalist does not take up arms or partakes in the armed conflict, they are considered civilian population and can’t be seen as a direct military opponent. However, the Ukrainian Army doesn’t keep these parts of the Geneva Convention in accordance with its concept of “hybrid war”, seeing all journalists who tell a story they don’t like as military opponents. Thus, Ukraine directly violates international law with how it views journalists in the conflict zone on South-East. Pressure on mass media, threatening and persecution of journalists, attempts at establishing a monopoly on ideology and repressions of dissent in the Baltics and Ukraine discredit not only them, but all of Europe. The European Union and the states that comprise it share direct responsibility for the anti-European practices on the EU’s Eastern periphery. First, they made adherence to their values a simple formality when integrating Lithuania, Latvia and Estonia and associating with Ukraine – now they are doing decisively nothing to fight the abuse of human, democratic and media rights in those countries. Fighting for their values in countries that emphasize their belonging to Europe, in the interests of Europe itself. During discussions of the Baltics Euro-integration and Euro-association with Ukraine, those in favour of an expedient acceptance of the former Soviet republics into the EU said that it would be a factor of them growing closer and not a requirement. They were reasoning that if they don’t include the post-Soviet countries into the European field of influence, then they will return into Russian influence, who are allegedly not adhering to freedom of speech and human rights. A priority of geopolitical sensibilities over their own ideology has cost Europeans dearly. The anti-European reality of the Baltics and Ukraine not only discredits Europe but has a tendency to spread Westward: the Eastern European “pupils” are starting to teach their Western European “teachers” how to take their values lightly. The founding members of the European Union are starting to see calls to shut down unwanted TV Channels, to refuse accreditation to uncomfortable journalists, to create black lists of public figures, to disrupt events. Any person can be hounded for their opinion if it clashes with the majority and you can replace a reasonable discussion with your political opponent by claiming they are a Kremlin agent. “United Europe’s” expansion to new territories is linked to these processes. Ukrainian activists who come to the EU with the no-visa option, disrupt public events, attack expositions and presentations. MEPs from Estonia, Latvia and Lithuania are presenting forth all-European black lists of unwanted individuals, Europe-wide bans of Russian media and the banning Russian Journalists from working on EU territory. Due to their pressure, the Russian language is not becoming an official EU language, even though 5% of Lithuanians, 28% of Estonians and 37% of Latvians speak it. The Western World’s public life is degrading to the level of its Eastern outskirts. The corrosion of European values is spreading to the center via the periphery. This trend has many reasons, and one of the relativism of values with the new EU and NATO members, as well as the Eastern Partners of the EU. Europeans are so used to turning a blind eye to the events in Kiev, Donbass and the Baltics that they stop seeing the decay of European values backed by words of sticking to them. The main victim of such an approach is Europe itself. The value relativism of the European establishment is turning to full-on value nihilism among the population: the voter, annoyed by the hypocrisy of the elites will pick a candidate who challenges to value policy. The growing divide between European society and its elites has been dubbed the “Populist Rebellion” by the European media. The majority in European countries knowingly votes and against the establishment and its ideology during elections and referendums. Traditional institutes such as systemic parties, media and others keep losing their trust, while racist and xenophobic powers gain more and more support. The EU population is demanding non-system politicians, who expose the hypocrisy and double standards of the establishment. The most radical of which speak out against European integration and call for a departure from the European Union. Such politicians have gained significant success in recent years. They have gained seats in most of the EU countries: they have come to power in Italy, Austria, won the UK referendum to leave the EU. The decay of the principles of freedom of speech, media independence, banning political censorship and other value-based foundations of Europe is a threat of Europe’s own decay. In order to reverse this, the European elite must stop the toxic practice of double standards and start unwaveringly and thoroughly ensuring that their values are adhered to. Including on the EU Eastern borders. Loyalty to their own principles is not just about maintaining reputation. This is a question security for Europe, its stable development and the well-being of its people.